Create your own special message with this Lily & Lotty Scripted rhodium plated sterling silver pendant. 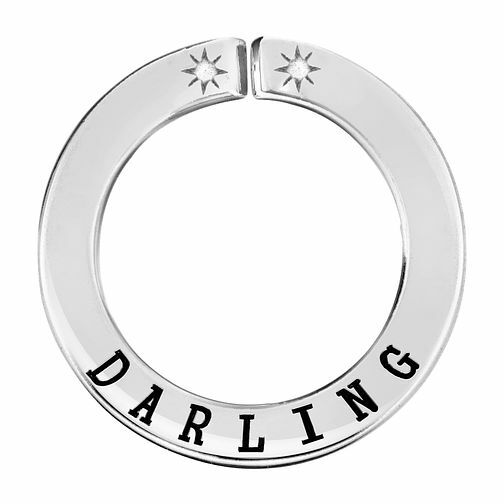 Engraved with the word ‘DARLING’, this pendant has two subtle diamonds on the front and an enamel red heart on the back. To make this a truly individual gift, for yourself or a loved one, you can mix and match this piece with other scripted rings from the collection to express your feelings by creating messages of love and friendship. Simply select the rings that you like to create a personalised, custom message of your choice. Include one of the collections belcher chains to make this an exceptional statement piece or select a shorter chain for a more delicate daily wear look; these are available in the lengths of 20” and 30”. All Lily & Lotty jewellery is presented in beautiful turquoise signature packaging which includes a luxury pouch, ribbon-tied gift box and a soft polishing cloth.